So this particular deck is a deck many people have probably imagined now that we have Polymorphous Rush. How awesome is it to end a game by having four or more of a particular card on the field? I don't know what was in the sideboard. I believe there were a couple foil Elspeths and foil Kioras running around, but from what I was told, the sideboard was never touched during the tournament. So this deck works pretty much the way you expect. You play a Biovisionary or two while ramping to get to a Polymorphous Rush. Jace helps you get there by getting you more cards, Sigiled "Scryfish" Starfish helps you look for your cards. 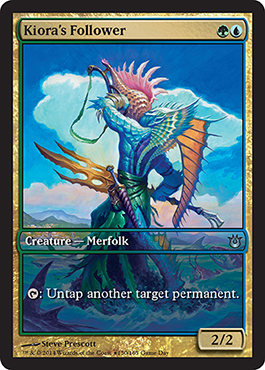 Kiora's Follower and Sylvan Caryatid help with ramping your mana to use multiple strive triggers with Polymorphous Rush. Cyclonic Rift allows for removal, as does Detention Sphere, and from what I've been told, the player using this deck overloaded Cyclonic Rift at the beginning of their opponent's end step forcing them to discard several cards. This is definitely a crazy deck that worked well and came out on top during an 8 person FNM tournament. Definitely try it out! Doesn't work. Polymorphous Rush doesn't create copies, it turns existing creatures into copies of a selected creature. So, to get it to work you need Biovisionary, three other creatures, Polymorphous Rush, and six open mana. Eric was playing it wrong. I don't know if he was playing it wrong or not, but I understand the principle behind how it is supposed to work and that is why this deck is here. I never said it makes copies. 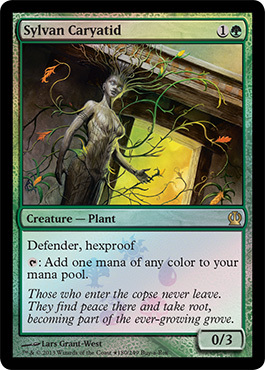 But yes, the bare minimum is six mana and four creatures with one of them being a Biovisionary. But it does work. Having played against Chad (the actual deck builder/owner) in the past, he wouldn't build a deck that doesn't actually work. The principle is sound, but the person who played the deck may not have played it correctly.